Last week, I posted a proposal to convert Interstate 235 from 42nd Street to East 14th Street into a boulevard. One of the reasons a project like this could benefit the city is by reclaiming vast amounts of unproductive land as taxable property. Across the country, cities are looking for ways to reverse decades-old planning decisions that facilitated decline of their downtowns and surrounding neighborhoods. Some of the most brilliant and innovative projects are those that stitch together neighborhoods torn apart by the construction of interstate highways. 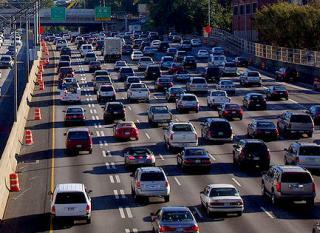 Yes, some particularly progressive cities are actually removing interstate highways! This approach seems counter intuitive to many people. Many Americans have grown up knowing no other option for moving people through a city or between cities. Indeed, as a means of moving a steady flow of individuals and goods across great distances to decentralized locations, the Interstate was a wonderful experiment. Intercity travel has become simple and relatively fast. Within cities, however, we have found quite the opposite. It was assumed by early planners that adding limited access highways as another layer in a complex transportation system would facilitate easy travel. Unlike previous transportation innovations, the limited access highway has never been adequately incorporated into a healthy urban environment. It is time to reconsider this experiment. What if Des Moines were to remove I-235 from 42nd Street to East 14th? What if we converted the limited-access highway that currently divides downtown from the surrounding neighborhoods into a six-lane boulevard with integrated public transportation and lined with appropriate retail/residential and commercial development? 42nd Street marks a change in the character of the neighborhoods that surround the highway. East of 42nd, it is clear that the highway sliced through established residential neighborhoods. West of 42nd, the underlying development pattern is not disrupted to the same extent. On the east, it is clear that any fundamental transportation planning initiative should include the Capitol complex, the river, and Downtown proper. And yet, we should also dream big... This could be the start of a larger project to convert the highway all the way through the Fairgrounds/University exit (or beyond) on the east. Knit Downtown and Capitol complex back into the street grid. Not only would this create additional land for residential and retail development, but would also drastically improve access into and out of downtown. Create approximately 100 prime "developable" acres in the central city. Sale of the land could top $26 million. Once built-up and after any development incentives have expired, the land could generate $6 million in annual tax revenue for the city. Promote more compact development and the opportunity to rethink underlying regional transportation strategy. Rather than continued expansion of the suburban and exurban fringe, the future will demand that we refocus on sustainable neighborhood redevelopment. Ewing Land Development (http://ewingdevelopment.com) has purchased the hotly contested Rice field from the Des Moines Public School District for just under $200,000. They intend to develop a 44-unit senior housing facility on the site - this is a disappointing end to a divisive debate. In order to fully realize the potential of this beautifully situated and eminently developable site, it should be occupied by relatively dense mixed-use residential and commercial. Given the images available on the Ewing web site, the building constructed will probably be best described as "suburban forgettable". Ultimately, as a single-use senior housing development, this project will represent a failure to plan for future expansion of the Beaverdale pedestrian commercial district. It is unfortunate that discussion surrounding the development of the former Rice Field in the Beaverdale neighborhood focuses so much on the personalities and process instead of the actual proposal. In my opinion, the best use for this particular site is clearly something more than open space. In order to grow into the 21st century, what Des Moines needs is actually more projects of the type proposed for the Rice Field site. From the long-term urban planning perspective, the City should be promoting and facilitating densification and expansion of our neighborhood commercial streets as true walkable mixed-use districts. The 6th Avenue Corridor through the River Bend and Cheatom Park Neighborhoods was named one of Iowa’s first Urban Neighborhood Districts by Main Street Iowa, a program within the Iowa Department of Economic Development (IDED). IDED Director Mike Tramontina named the new designees at a ceremony on Monday at 2 p.m. The Des Moines Rehabbers Club seeks nominations from the public to name "Des Moines' Seven Most Endangered Buildings." Neighborhood groups, individuals, and businesses are encouraged to submit nominations for buildings in danger of demolition or neglect. Nomination forms are available for download at http://renovatedsm.com/node/305 and must be received by September 22, 2008. Eligible buildings must be located within the city of Des Moines, must be threatened with active demolition or severe neglect, and should not be in a condition that is beyond the possibility of rehabilitation. Buildings may be residential or commercial, of any size and being used for any purpose. The list will be announced in mid-October. Before diving in to the reasons the Des Moines downtown skywalk system should disappear, I'll first lay out the reason why it should stay: Iowa gets cold. It's no fun walking anywhere when the thermometer reads 10 degrees below zero, particularly if young children are involved! That said, I think the skywalks are holding downtown back from a complete revitalization.